The challenge to you this month is "It’s a Guy Thing". This could be a card, banner, journal page, scrapbook page, anything you may may need that has a guy theme! Use any set you have (you don't have to limit your entry to Raisin Boat stamps), but if you use a Raisin Boat stamp set, it will count as two entries. That gives you twice the chance to win a FREE stamp set of your choice! You can enter as often as you like. Remember, you can either buy OR rent Raisin Boat sets -- no guilt in using a set for just one project, such as this challenge. Raisin Boat have an amazing collection of stamps and many that can be used for a “Masculine Theme.” This is a great challenge that will help you stock up on guy card for when my need them. The possibilities are endless! 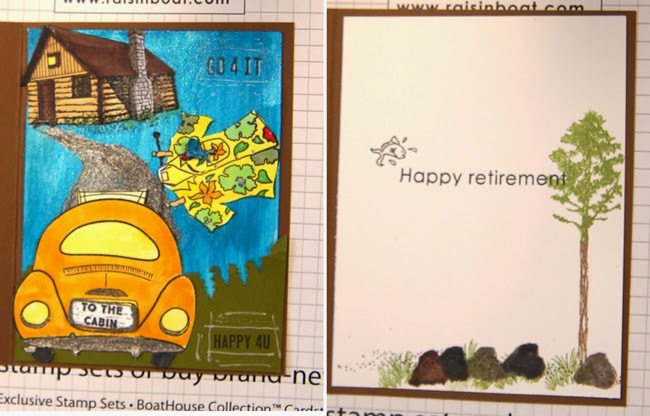 Here is the card I created, but check out the Idea Gallery for well over 1,000 more samples that you can search by Raisin Boat stamp set title! Just a few of my favorite sets and some 3D paint. I am really having fun with that. I hope to see your name on the list of participants. Love love love this! LOVING the car and the house!!!!! Hi Linda I have popped by to thank you for visiting my blog and leaving me such lovely comments, for some reason I am not getting them in my mail box, not sure what is going on. I have been thinking about you and often visit your blog to see your work, I have missed your posts, hope all is well with you.